An Inflatable Sport Boat Is Durable, Fun, And Folds Down Into A Small Package! 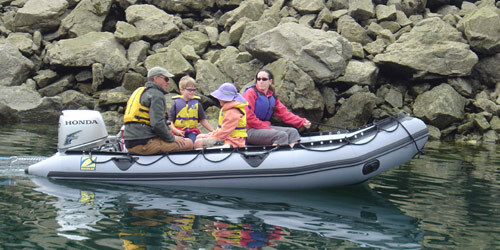 Collapsible or foldable boats with a transom are often called inflatable sport boats or inflatable dinghies. There is a lot of disagreement amongst buyers and sellers about which boats are "sport boats" and which are "dinghies" and which are "heavy duty" and which are "light duty". The reason is there is no clear cut line! If you want to read more about how to differentiate between light duty boats, sport boats and heavy duty boats then read this page. I like an inflatable sport boat for the reason that they are tough and multipurpose. You can load in enough camping gear for 3 or 4 days on a remote beach. You can tow a skier or tube, and you can outfit them for fishing. Even though sport boats are durable craft they can still be folded up - which allows them to be carried in the back of a vehicle! I think of sport boats as having aluminum or wood sectional floors, there are a lot of different floors available though, so you can read more about floors on this page. I believe an inflatable sport boat is a great boat for almost everything, family activities, fishing, and extensive exploring. Be warned though, these boats do not have the rough water handling characteristics of a rib! When the going gets really rough collapsible boats will need to slow down, (at least I do) unless you enjoy pounding through the waves! Even with an inflatable keel these boats are still relatively flat on the bottom. So that is the big trade off.... do you want the portability of a collapsible boat or would you rather trailer a rigid hull and get superb rough water handling. Some inflatable boat companies claim their collapsible boats have handling characteristics comparable to a rib. I don't believe it! Collapsible sport boats are great, but there are always trade offs. I believe all of the above boat models use fabric to attach the transom to the tubes, which is the method of transom attachment also found on all "true" heavy duty boats. There are surprisingly few boat models to place in my "sport boat" group ..... 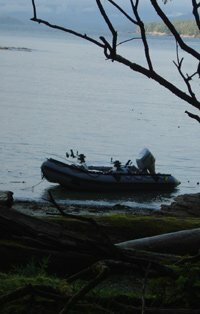 I think most boats are built as light duty boats, and therefore fit better in the "dinghy" group. Many white label brands or OEM brands that are made in China offer what they call a "heavy duty" boat. These so called "heavy duty" collapsible boats are hopefully made to withstand more rugged use and many people would include them in the "sport boat" category. A boat like Mercury Marine's Heavy Duty series would be a similar boat to the heavy duty boats sold by white label brands and OEM "made in China" brands. My one big concern with all these models is they use plastic transom mounts to attach the transom to the tubes. Even if they use heavier fabric in the tubes, and beefier rubbing strakes, and double layers on the tube bottoms, and more D ring lash points, and better perimeter ropes, they still all seem to use the standard plastic mount to attach the all important transom to the tubes. My experience has been that these mounts are not as durable over time as a transom glued in with fabric. Again.... I am giving as much information as I can to help you decide what would be the best boat for you.